Title: Sanbiki no Ossan 2 ~ Seigi no Mikata, Futatabi! 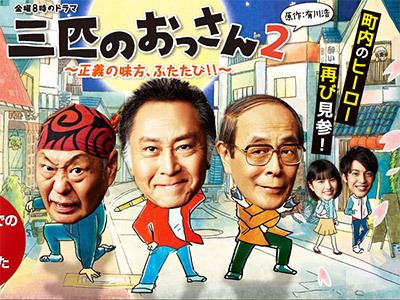 Kiyota Kiyokazu (Kitaoji Kinya), Tachibana Shigeo (Izumiya Shigeru) and Arimura Norio (Shiga Kotaro) are three old men who formed a neighbourhood watch group called �eSanbiki no Ossan�f one year ago to tackle all sorts of bad things that are rampant in the town such as fraud, molest and animal abuse. They still continue their patrols at night. 2014 Sanbiki no Ossan 3 ~ Seigi no Mikata, Mitabi! Same as season 1, predictable, sometimes funny, but nothing new added.